How your association’s board can effectively fulfill its strategic role – Sea to Sky Meeting and Association Management Inc. I am a member of the Canadian Society of Association Executives (CSAE). One benefit I really appreciate, along with the excellent library, is the webinar series. When I am thinking about a topic, I often find myself on the CSAE website to see what resources exist on that topic. I recently had a discussion with a colleague about how boards can play their strategic role effectively. I thought I would see what CSAE resource were available, and located a webinar delivered by Ron Knowles. If this subject interests you, you may want to watch his webinar. Here is my take on what he discussed. First up, it’s important to recognize the challenges that may stand in your way. These include: a tendency for boards to develop incremental strategic plans year to year making their long-range planning obsolete; a craving for concrete outcomes and a comfort with operational planning, which pushes out the important strategic conversations; and vision fatigue – people just get tired of planning. That said, it is so important to overcome these obstacles! Operational planning is necessary and measurable successes are great, but ultimately a board’s role is to look after the bigger picture and to articulate a vision for where the organization is going so that everybody has a clear idea of what they should be working towards. How is our membership changing? Can our members clearly describe the value we deliver as an organization? Do our services meet our members’ needs? Are we operating as efficiently as we could be? Are staff and board members clear about what their roles are? Ron reiterates that strategic planning is what you do with the answers to these (and many more) questions you consider about your organization. Make sure you carve out some time for strategic planning at the board level with a dedicated meeting or workshop. Board members should come to that meeting armed with their own list of relevant questions tailored to their strengths or areas of expertise. Be constructive and positive, but politely assertive – it is the right and responsibility of board members to have their strategic questions addressed. The chair of the board should be the facilitator of this process and should define the framework for the strategic plan. It’s also important to get the input of your members in the strategic planning process. Surveys, roundtables, and membership councils are good for this. Make sure members feel appreciated for giving their feedback and make sure to keep them informed of the results of your work. 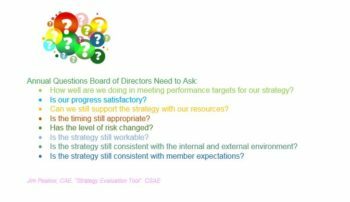 Finally, Ron discusses the tendency for boards to complete a strategic planning process and then forget all about it until the next time – as long as five years later! Avoid this by ensuring that your strategic plan contains clear, realistic goals over defined periods and that board meeting agendas include time for evaluation, strategic thinking, and scanning the future. I have found this last point, about agendas, to be a particularly helpful reminder about how often it is the small ‘nudges’ to be being more strategic that create the most change. If you want to discuss your association’s board and how Sea to Sky can assist, give me a call.